Flight Display Systems has introduced Fly HD, a totally new concept in aircraft video technology. Fly HD is a complete high-definition system that is easy to install and provides full 1080p video quality. There’s a high-definition transformation happening in the video world and many aircraft cabin avionics are quickly becoming outdated. Aircraft owners are looking for simple, cost-effective ways to upgrade aircraft video systems. Flight Display Systems had two goals when designing Fly HD: build high quality components and make them simple to install. These goals were achieved by engineering the components to use HD-SDI signals on the common coaxial cable that is already installed on many aircraft. This reduces the number of converters required and limits the amount of rewiring necessary. Fewer converters and less rewiring equals lower total cost for a full 1080p HD video system. "We’ve been working towards creating an end-to-end high-definition system like this for years," says David Gray, president of Flight Display Systems. "Now we have cracked the code to perfect aircraft HD video that delivers true VIP experience for in-flight entertainment and other video." 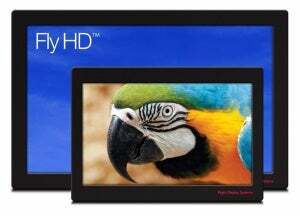 The Fly HD monitors from Flight Display Systems are available for a variety of functions, sized from 7in to 55in in Widescreen format. The smaller 7in and 10in can be attached to arm mounts for cockpit usage. Larger widescreen displays are typically used on bulkheads and in custom-built consoles. The key to the system is HD-SDI, which can transmit a full uncompressed 1080p High-Definition signal via one coaxial cable. HD-SDI cabling is a thin coaxial cable with BNC connectors. Flight Display Systems provides several HD-SDI crossover switches, allowing multiple sources to be transmitted to multiple monitors. Flight Display Systems manufactures high-definition source equipment such as a 1080p cockpit camera, however the 1080p monitors are perfectly suitable for existing surveillance camera equipment. Our special mission and law enforcement customers use the high-definition digital video recorder for mission tracking and playback.